Homestays are one of the finest ways to understand the culture, traditions, daily lives, cuisine and the societal structure of the locals of any region/country. Homestays are highly recommended as they proffer you the opportunity to mingle with a family at close quarters, making interactions easy and giving you insights into who they really are! 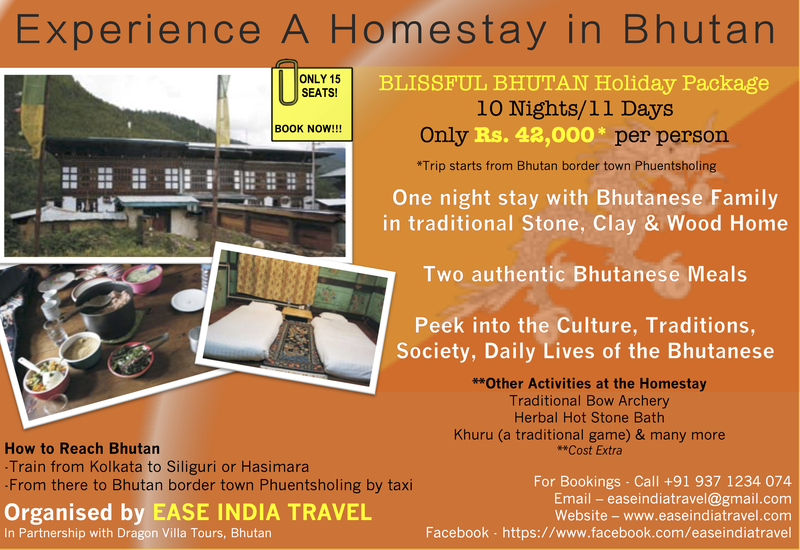 For our Blissful Bhutan tour we have arranged a one night stay at a homestay at one of the most beautiful and newly opened districts of Bhutan, Haa. The stay will include two home made Bhutanese meals. The hosts also offer a host of other activities (at extra cost) such as archery (their National sport), herbal hot stone baths, Khuru (a traditional game) etc. Just email your enquiry to easeindiatravel@gmail.com or if in India, just call us on +91 937 1234 074. We would be delighted to share the detailed itinerary and other details with you. Our tour starts from Bhutan border town Phuentsholing. Overnight trains from Kolkata to Siliguri or Hasimara and thereafter by taxi will take you to Phuentsholing. Hasimara is the nearest railhead and the cheapest way to reach Bhutan.